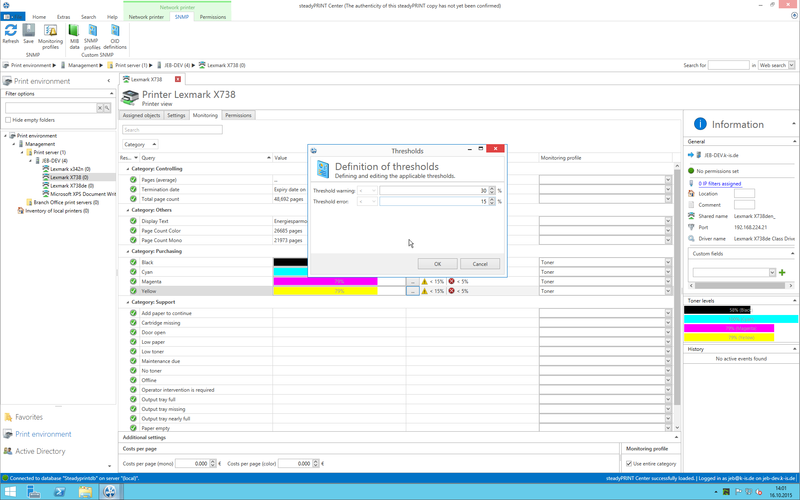 We have noticed that steadyPRINT creates log files in the user profile, or more precisely in the AppData directory. This is desirable and helps us in troubleshooting. Is it possible to adjust the logging so that steadyPRINT writes less information, i.e. only errors? Automatically send an e-mail to Purchasing if the yellow cartridge of a printer shows low content. To forward errors in the printing environment to the correct department, some settings have to be performed in advance. In this environment steadyPRINT offers very individual configuration options. Once the configuration has been performed, most processes can be completed automatically. First, an e-mail profile has to be created. If a toner cartridge shows a low content, the purchasing department shall be notified by e-mail in order to order new cartridges. After the start of steadyPRINT, click File –> Settings and open the e-mail profiles. We now want to define in the action profile when an e-mail is to be sent to Purchasing. 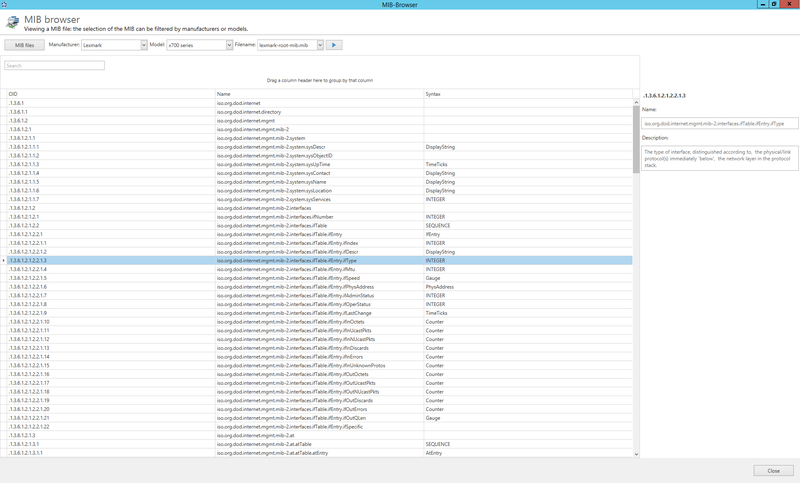 Creating the action profile: Click File –> Settings and open the action profiles. We link the action profile to the e-mail profile just created. The results shall nevertheless be stored to the database so that we can understand in the subsequent course what has happened on our system. The action profile initiates steadyPRINT to send an e-mail via the linked e-mail profile to the purchasing department and to store something to the database. Now, it has to be determined when an e-mail is to be sent and what should be stored to the database. 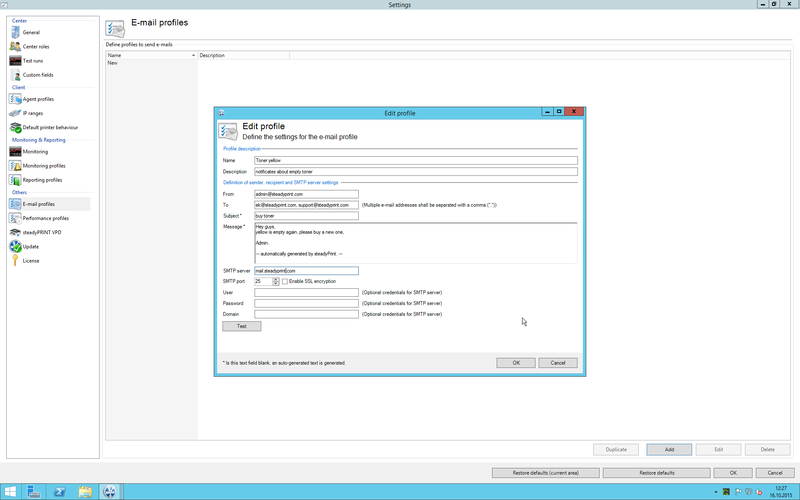 This is quite simple: Once the values for error or warnings of the SNMP query have been linked to an action profile and the check box has been selected in the action profile under “entered to database”, the data is automatically transferred to the database and – if the e-mail profile is linked – sent to the corresponding body. 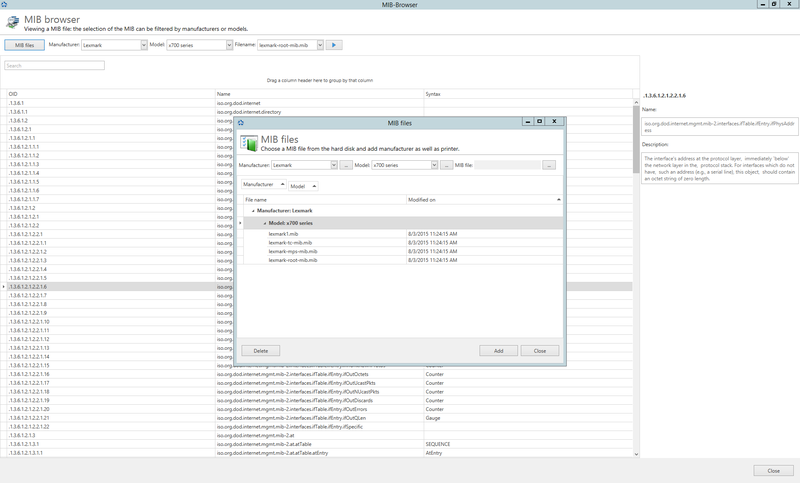 In order to assign the action profile to the SNMP query, click the column action profile next to the SNMP query and select the created action profile. By default, the entire category is assigned to the action profile. We now assign the profile and are asked to store. Congratulations, you have successfully created an e-mail and action profile and linked both to a SNMP query. Warnings and errors regarding your SNMP query are now automatically sent to Purchasing and stored to the database. The examples are described in detail and discuss the problems and questions our customers have dealt with in the area of SNMP. We have summarized these examples to keep you from facing the same problems. 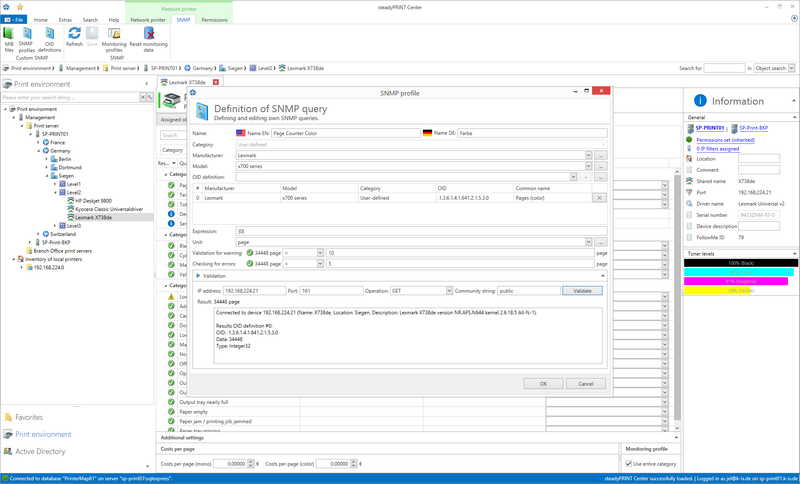 SNMP queries are supoosed to automatically show if something is not in order so that your daily work with the printing environment is as easy as possible and the additional work for the partly complex configuration settings is justified. It would be even better if all problems arising in a printing environment were not only apparent for the administrator but also sent to the department responsible for the for the department responsible for rectifying the error. With steadyPRINT you are in a position to do so in just a few minutes! The examples cover specific problems of our customers, but, with slight adjustments, can also serve as an example for superior problems. Thus, example 1.1 can also be understood as a general example for sending e-mails to a recipient after an SNMP event has occurred. Only the specific settings have to be adjusted. Automatically send an e-mail to the purchasing department when the yellow cartridge of a printer is almost empty. For more detailed information click here. 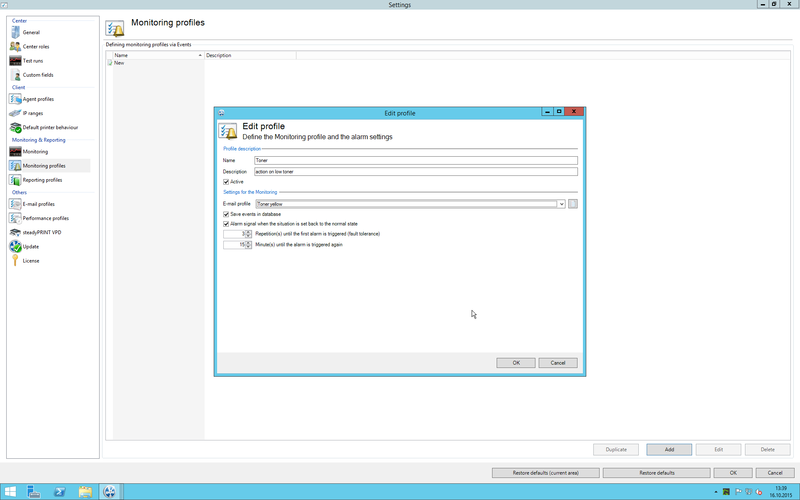 Change warning and error thresholds of a default SNMP query and send by e-mail. For more detailed information clickhere. 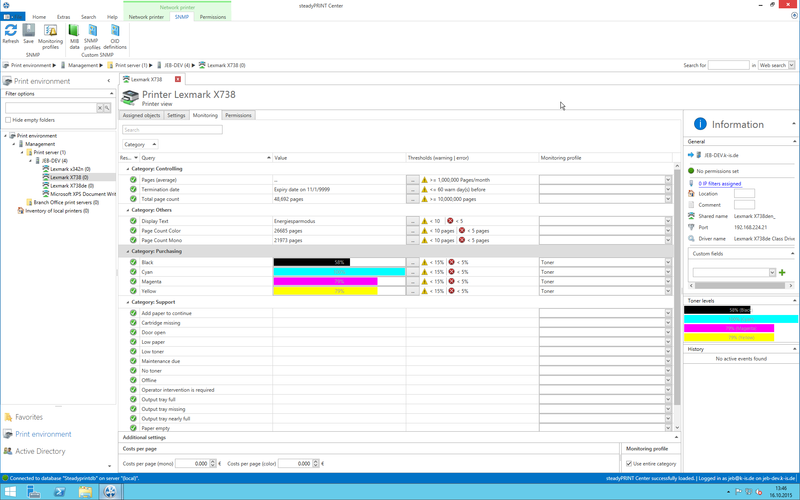 Use action and e-mail profile for several SNMP queries (send all toner levels). For more detailed information ckick here. Adjustments of all printers on print server environment. For more detailed information click here. 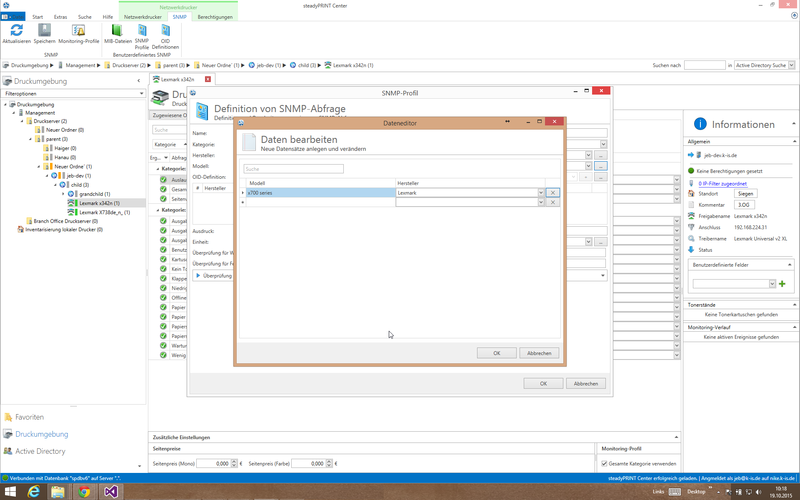 Create an own SNMP query (OID is known). For more detailed information click here. Create own SNMP query (OID unknown). For more detailed information click here. 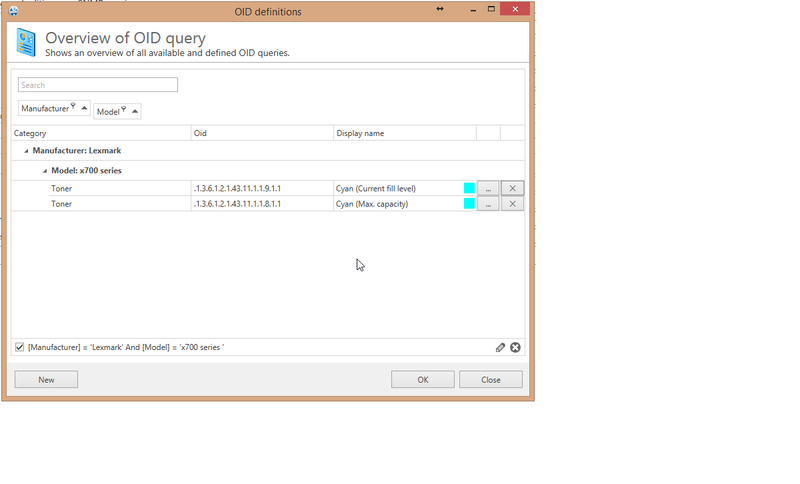 Create queries from several OID queries. For more detailed information click here. Edit SNMP queries. For more detailed information click here. Create own SNMP query for a toner color. For more detailed information click here. This chapter aims to adjust the values for a warning and an error of the yellow toner cartridge. The default value for a cartridge error is at 5% and a warning will be issued with a cartridge content of 15%. As the printer is heavily used, this value is too low. We want to have the warning already issued with a content of 30% and an error displayed at 15% and have an e-mail automatically sent so that Purchasing is able to react in good time. With steadyPRINT this adjustment can be performed in just a minute. After the start of steadyPRINT, we open the printing environment on the left hand side of the tree. We select the desired printer and open the Monitoring tab. Next to the bar for the yellow cartridge we click the button “…” and the window “thresholds” opens. Enter 30 to the line Threshold Warning and 15 to the line Threshold Error and confirm with “OK”. 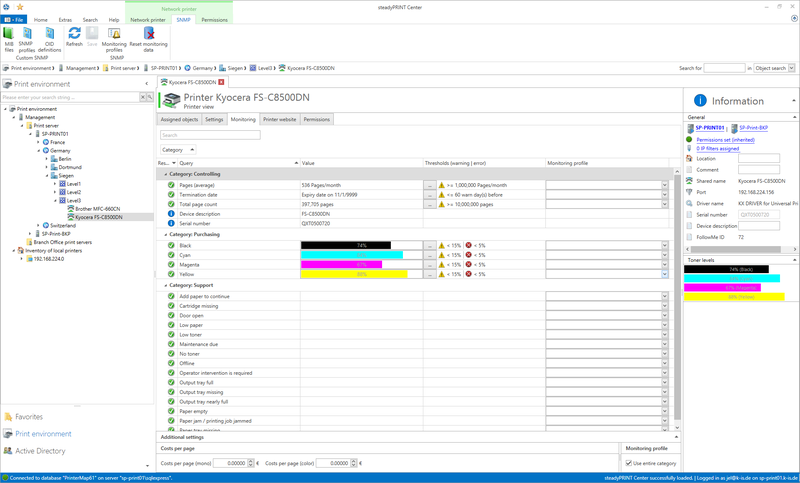 In the Monitoring window, the action profile Purchasing (see example 0) in the column Action Profile has to be selected for the yellow toner cartridge. Now the adjustment of the thresholds for error and warning is complete and Purchasing will be notified earlier of the status of the cartridge. For each SNMP query you can individually determine (like in the previous examples) what should be done in case of an error or warning. In order to keep the configuration effort low, you can also use an action profile (linked to an e-mail profile) for several or all SNMP queries. For this purpose, you convert the automated e-mail in the e-mail profile into a more general form or create a new e-mail profile (example 1.1). You can even modify the action profile or create a new one. 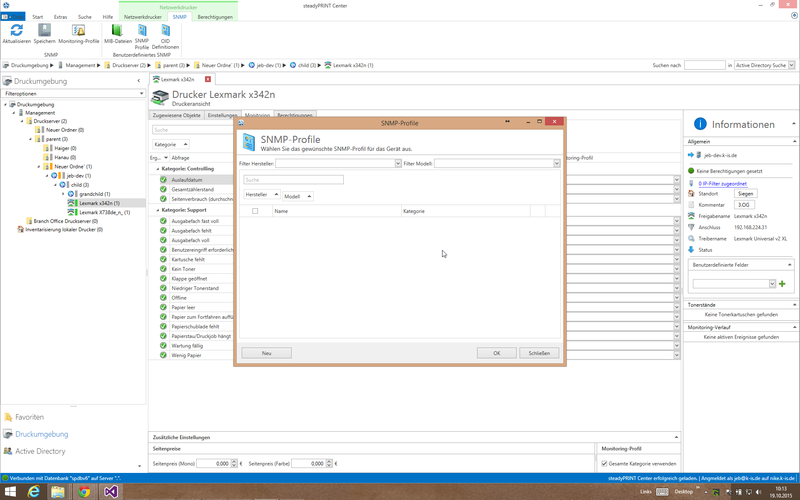 Finally you assign the action profile to the SNMP queries and click the Store button. Changes that are made on the print server level are transferred to all printers below this print server. 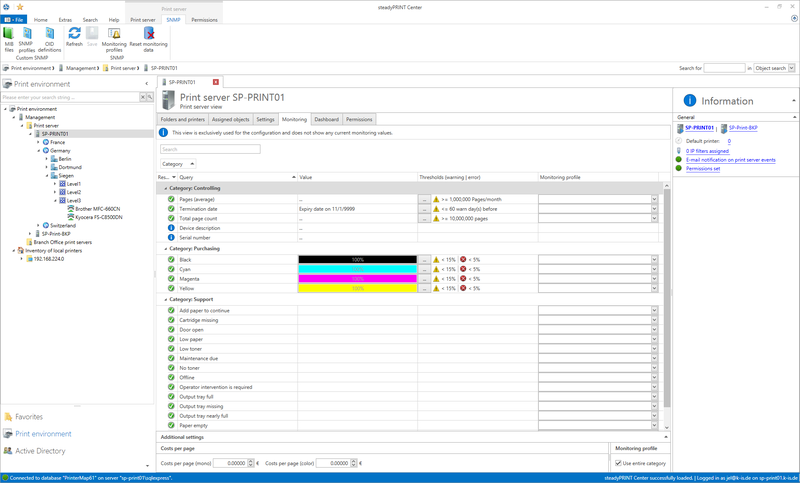 If a Monitoring profile on print server level is assigned to a SNMP query and then stored, this profile is also linked to all printers below. Even the modification of thresholds or the creation of own SNMP queries in this view affects all subjacent printers. We recommend to perform all global settings for all printers on print server level first and then to make the specific settings for a single printer. In this example an OID is used that only returns values for a Lexmark printer. For a printer of a different manufacturer, the OID has to be adjusted. In this example, it can be assumed that the used OID is known. In order to make the example universal, the OID, the manufacturer and the model have to be adjusted. We want to create an own SNMP query for a Lexmark printer. The query is expected to return the number of pages printed in color. 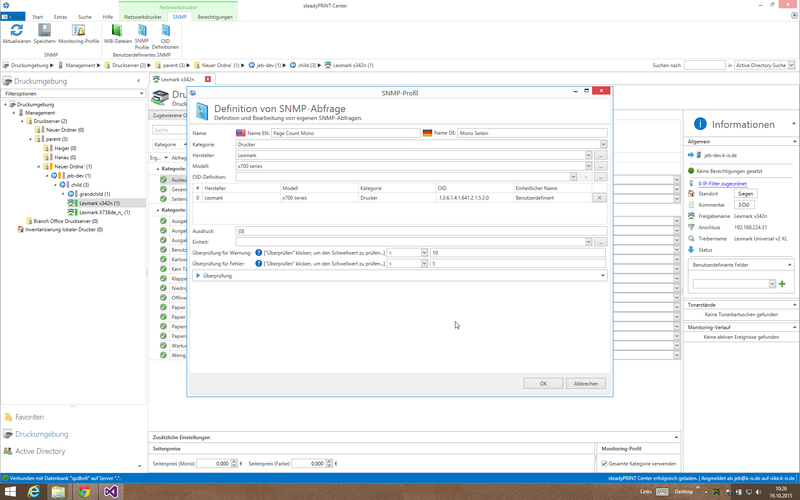 In order to create our own SNMP query, we open the Monitoring tab in the printer view and select the SNMP profiles in the ribbon. We click New and the window (defintion of a SNMP query) opens which we then complete. For the English name we enter: “Page Count Color”. For the German name : “Seitenzahl in Farbe”. Under “category” we select custom and create a manufacutrer “Lexmark” and a model “x700 series which we link to the manufacturer. Getting back to the definition of our SNMP query, we select the manufacturer and the model. 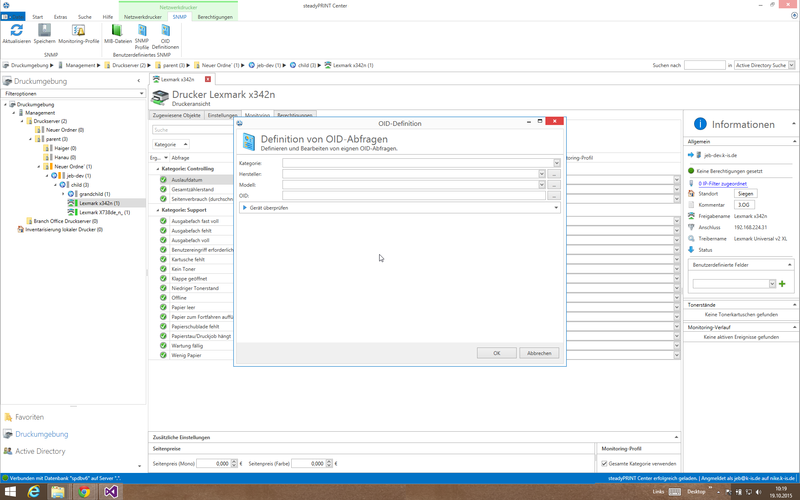 In the window definition SNMP query we click “…” next to the OID definition and again New in the window Overview of OID queries. “+” and all entries with “OK”. 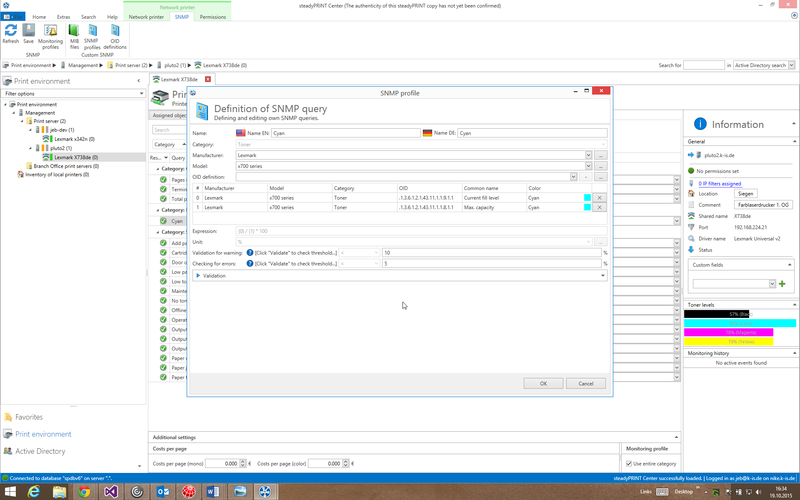 Back in the window SNMP queries, we click the check box “page count color” next to the newly created SNMP query. We again confirm with OK and the new SNMP query is displayed in the Monitoring. If you do not know exactly which OID is required for the SNMP query, use the MIB browser to find the OID for your model. MIB files can be directly obtained from the manufacturer of the device that you want to monitor. We want, for example, read out the number of pages printed in black and white on a Lexmark printer. After some internet research we have found out that the SNMP queries regarding this topic can be found in the Lexmark1.mib file. We download the Lexmark1.mib of the manufacturer. After starting steadyPRINT we open the MIB browser under Extras in the ribbon. First, we create a new MIB profile by clicking the button “Mib profiles”. MIB profiles serve to link a MIB file to a manufacturer and a model in order to simplify the administration. If you require numerous OIDs for different printers in the course of your application, the profiles represent an enormous improvement to keep the overview. We select the manufacturer “Lexmark” and the model “x630” from the lists of manufacturer and models (example 4.1). As an alternative, we can also create a new manufacturer and a new model. We open the file browser “…” and select the MIB file Lexmark1.mib by accessing the downloaded MIB file. Having confirmed with “OK“ the window closes. The file „Lexmark1.mib“ is already predefined in the MIB browser. We load the file to the browser by clicking the „Play“ button. In order to quickly navigate to the requested OID, we enter “mono” in the search button and a filtered selection of OIDs is displayed. We select the OID “.1.3.6.1.4.1.641.2.1.5.2” and copy it to the clipboard. 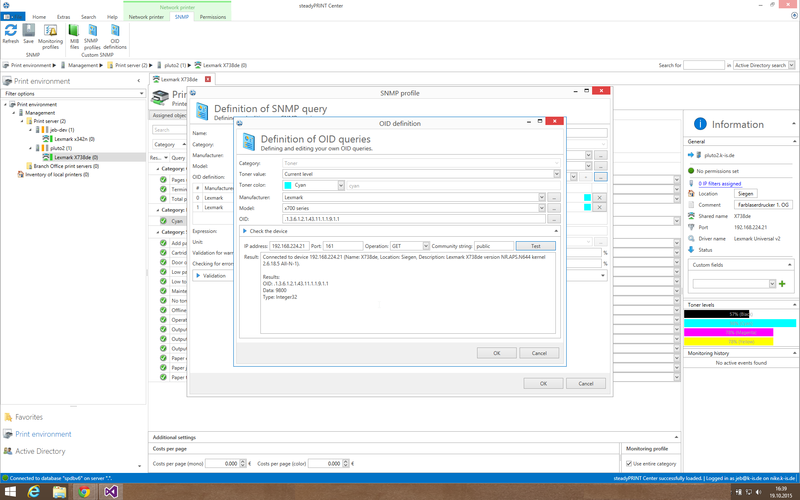 You can create SNMP queries from any number of OID queries. A classic example for a SNMP profile consisting of several OIDs is the determination of the fill level of the cartridge. In order to determine this value, the current fill value has to be subtracted from the maximum fill value and divided by 100. The sum of this result is the current fill value in percent (%). We choose the color Cyan and the max. capacity. We enter 1.3.6.1.2.1.43.11.1.1.8.1.1 as the OID and confirm with “OK”. Now we create the second query with current capacity. We enter 1.3.6.1.2.1.43.11.1.1.9.1.1 as the OID and again confirm with “OK”.